How to build an elevated deck.? How to build an elevated deck that holds brick pavers? You don’t have to go structural steel. You don’t have to spend that kind of money. 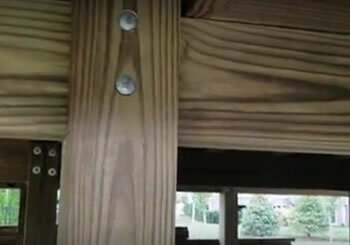 How to build an elevated deck that’s beautiful, durable, maintenance-free? I’ll show you the construction and how we build an elevated deck to hold brick pavers in Macomb and Oakland County, Michigan. The posts are really large in size to hold the weight of the brick pavers. The beams are oversized. The joists are oversized. How to build an elevated deck? We have the engineered plans to build your elevated deck to hold brick pavers, in Shelby Township, Washington Township, Oakland Township, and Macomb Township. I Want a FREE QUOTE on an Elevated Brick Paver Deck Design! How to build an elevated deck with brick pavers? Give us a call at 586-752-2200.